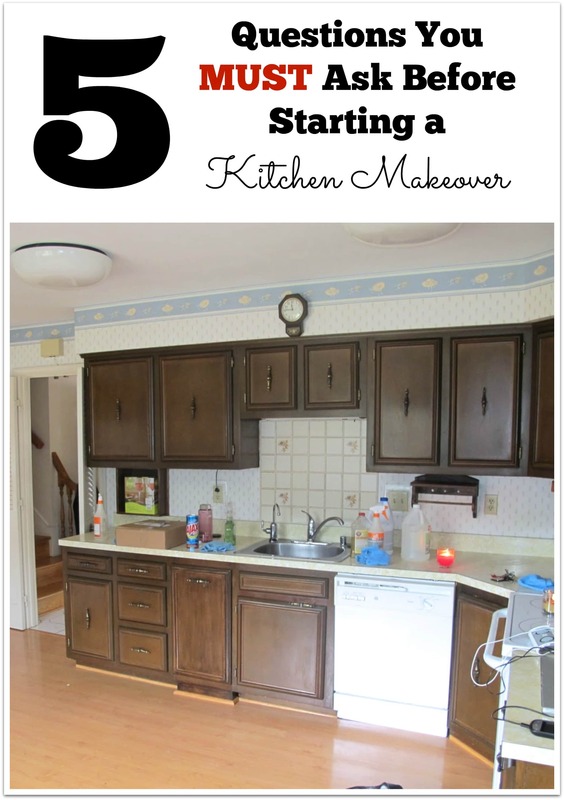 5 Questions You MUST Ask Before Starting a Kitchen Makeover! When we bought this old 1973 home, a total kitchen makeover or overhaul was the furthest thing from my mind. I mean…I knew that I would need to paint these kitchen cabinets because they were sooooo dated, but I hadn’t planned to do much else. We simply couldn’t afford to do so. But I didn’t suspect that after moving in, what I thought would be a simply kitchen cabinet refinishing would turn into a “let’s-just-rip-everything-out” venture that took a $10,000 chunk out of our left-over “emergency” fund. We ended up having to buy new cabinets. First, let me preface this post by saying that when we moved in, we had no idea how in the world we were going to manage a single-family home on our own. I literally walked around for 2 months after going to settlement, feeling like we’d made the wrong mistake in making such a big jump from a 2-bedroom condo to an overwhelming 4-bedroom house! What little money we had left after selling the condo and moving here, we really needed to conserve. Instead, we ended up paying over $10,000 for a new kitchen! GASP! $5,000 of that my mother-in-law gave us, which we felt bad having to accept from her when we weren’t planning on doing this kind of improvement. Hindsight is always 20/20, so here are the questions that I wish I would have asked myself before jumping into such an expensive, overwhelming situation! There are less expensive options that you should consider. 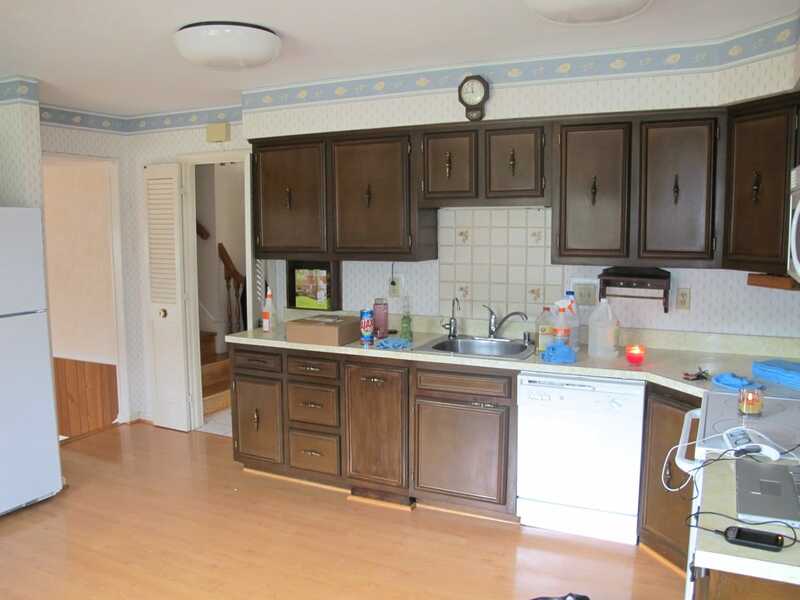 QUESTION #1: Can I Paint the Kitchen Cabinets Instead? When doing a kitchen makeover, the biggest question is, what you’re going to do with the kitchen cabinets? It’s the first place your eyes land when entering a kitchen, right? And if they look horrible, people will notice. YOU will notice every time you come into the kitchen. But, kitchen cabinets are not cheap, my friend. Those hunks of wood costs thousands of dollars to purchase, and even more money to pay someone to install them (if you don’t know how to do it yourself). In that case, if your old kitchen cabinets are in good condition, aren’t falling off, aren’t cracked, worn, etc., then painting them is a great option. The reason I didn’t paint mine was that when we moved in, I thought just scrubbing down the inside and then painting them would be a quick, easy fix. 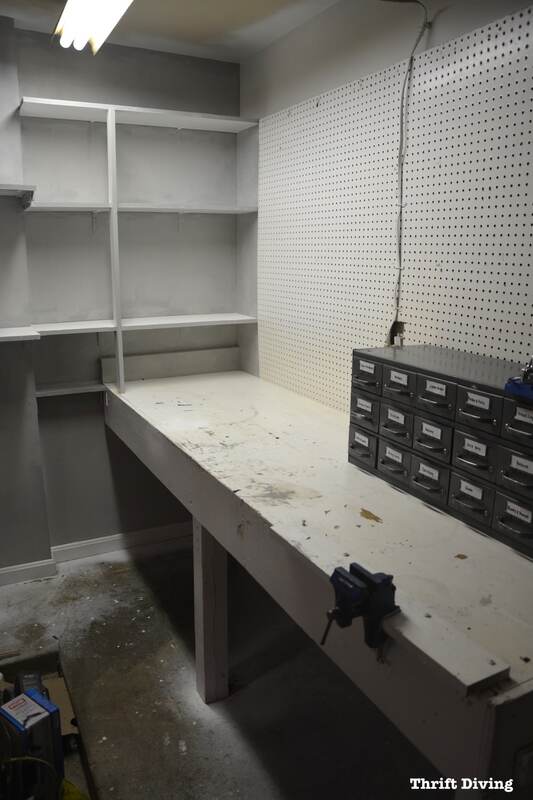 To my dismay, the insides of the cabinets were the funkiest funk I have ever smelled! UGH! I have no idea what the previous homeowners were storing in those cabinets, but soap and water wasn’t the answer to getting out that stench! A better solution would have been to bleach or vinegar the heck out of them. 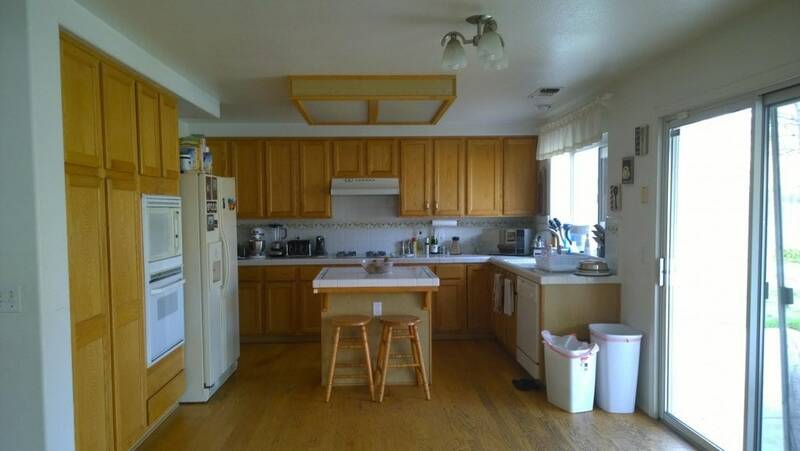 But the thought of putting our dishes into nasty cabinets–huh uh–didn’t seem like a solution. So we paid someone to come in and install new kitchen cabinets. (Excuse the fuzzy pics–my old cell phone was a beast). If you can paint your kitchen cabinets, give it a try! There are a ton of things you can do with furniture paint when it comes to painting your kitchen cabinets! If you’ve got dark wood cabinets, lightening up a kitchen isn’t difficult if you just go white and bright. You don’t want everything to be white, so add some color to your kitchen islands, maybe something darker, to help ground the island. 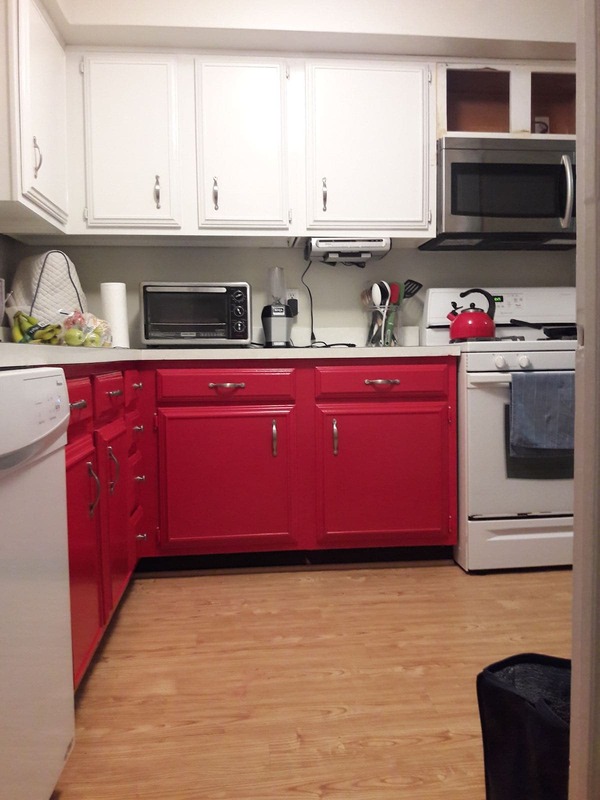 Blog reader, Kelly, wanted to makeover her kitchen but didn’t want to just do everything white, so she painted the lower cabinets red. Remember: everything doesn’t have to be “matchy-matchy”! 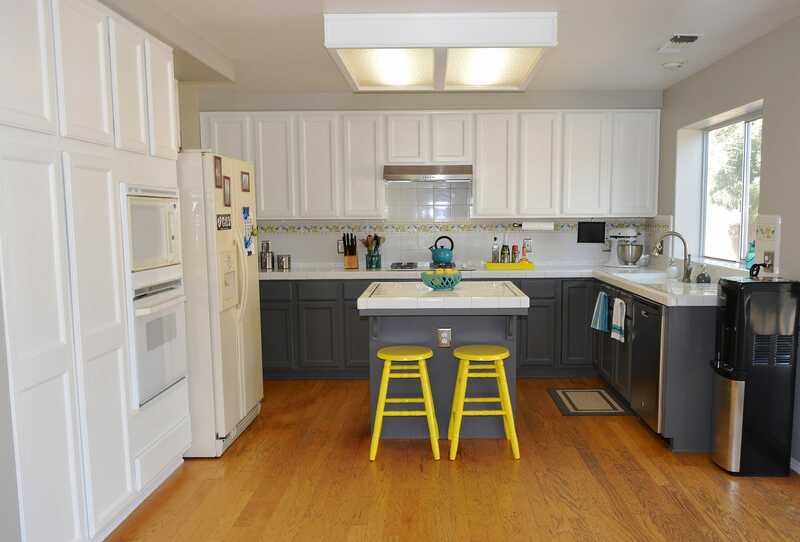 Blog reader, Maria, went bright and white, but painted the lower cabinets gray, with a splash of yellow stools. Love this look! What Paint Should You Use for Painting Kitchen Cabinets? One of the easiest furniture paints to use for painting furniture and cabinets is Beyond Paint. You can buy it in either the gallon size or the quart. 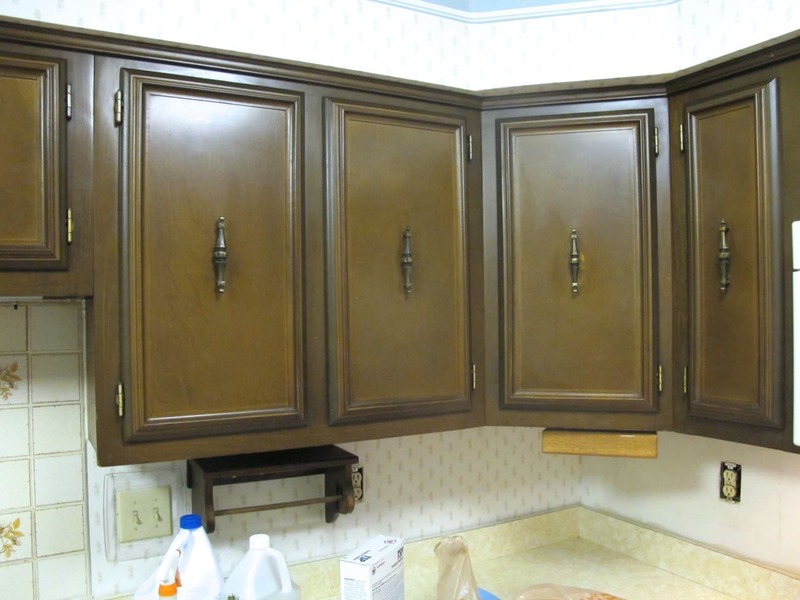 It’s a bit pricey, but considering the cost of new cabinets, the cost of the paint is a drop in the bucket. It works right out of the container without sanding or priming (just be sure to clean the surface of the cabinets and cabinet faces really good first). STEP 4: Add a second coat of paint. STEP 5: Use two coats of Beyond Paint Multi-Surface sealer to protect the paint. 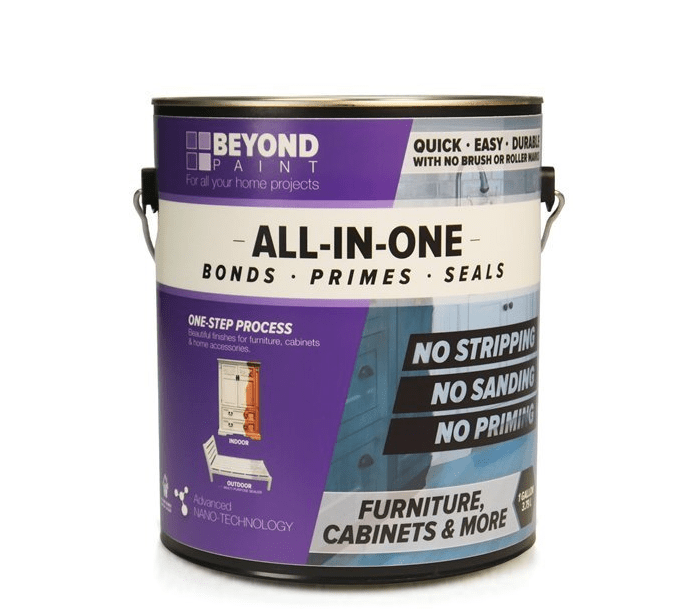 You can buy Beyond Paint on Amazon, HomeDepot.com, directly from their website, and other places online. It’s not sold in stores yet. I recommend buying it on Amazon because, with Prime, you can get 1 or 2-day shipping free. QUESTION #2: Can I DIY the Kitchen Counter Top? In a nutshell, yes you can. In fact, the Beyond Paint that I mentioned above, works well for painting countertops (heck–you can also use contact paper for covering your kitchen countertops!). 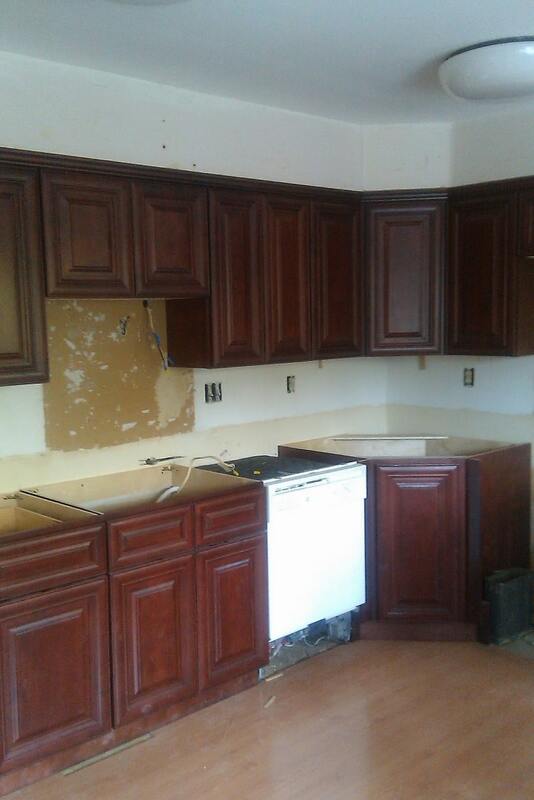 You can see in this “BEFORE” picture of my old kitchen, the countertops were super outdated. We ended up paying thousands for the contractor to install Silestone countertops. Had I known that there were options that were less expensive, I would have gone that route first before investing tons of money into replacing old countertops. 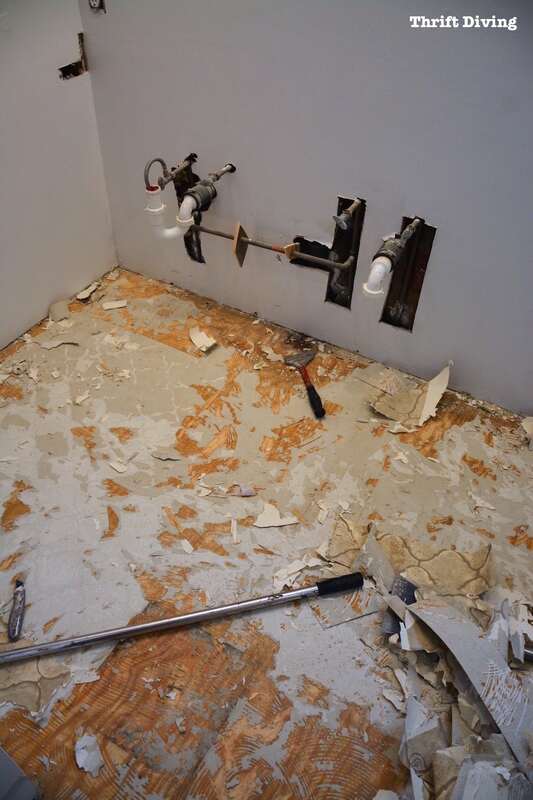 After buying a house, the last thing you want to do is rip out things (like countertops!) that you hadn’t budgeted for. 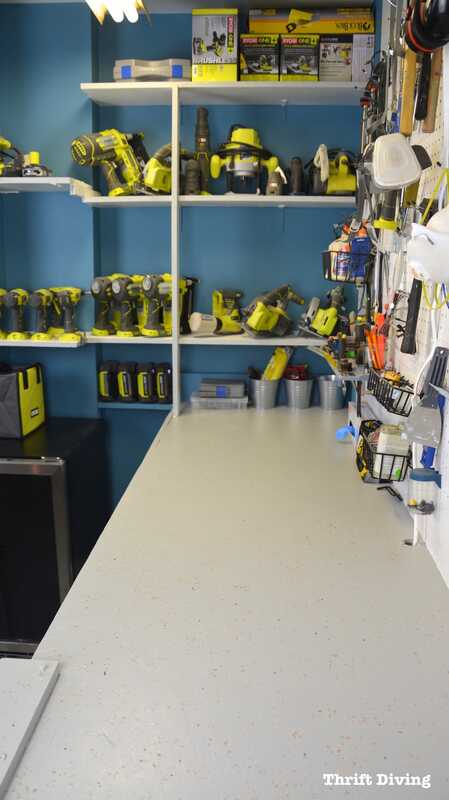 While I have never painted my kitchen countertops, I did paint my garage workbench using Beyond Paint. Although I know it’s not the exact same, these pictures show you how they’d look if you used their Countertop Paint Kit. Now, it looks clean and even has the decorative little countertop flecks. At a DIY blogging conference, I met a brand called Paper Transformations that makes painted paper that can be easily glued to your old countertops. It actually resembles granite! Watch the video below to see how it’s done and to see if it’s the right choice for your countertops. I haven’t had a chance to try it yet, but when I saw it at the conference, it looked amazing! It’s much cheaper than getting new countertops, too. 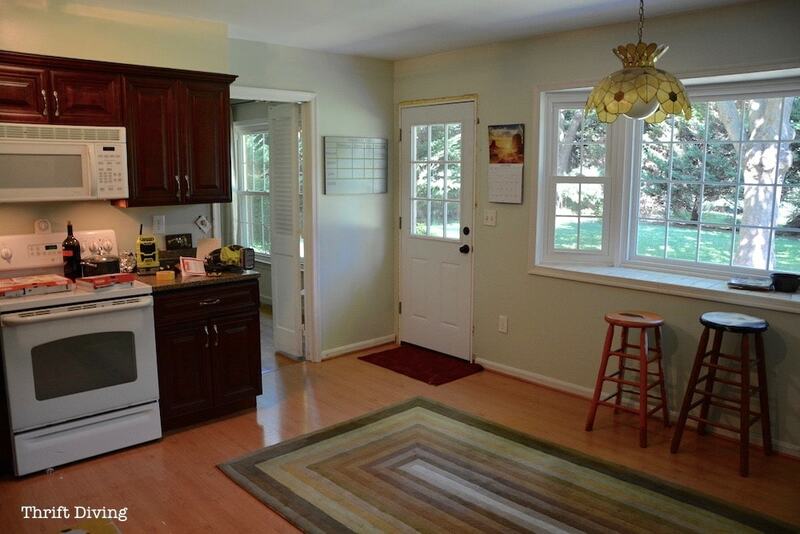 QUESTION #3: What Paint Colors Work Well For This Kitchen? This has been a hard one for us: paint colors! After removing all the wallpaper in this kitchen and repairing the walls where the wallpaper damaged it, it was time to figure out what color to paint the kitchen. I eventually settled on what I thought was a very nice shade of yellow. However, I later dubbed this color “school bus yellow.” LOL. I came to dispise it! Later, I got tired of the school-bus-yellow and decided to paint it a soft green. This good news is that there is a small device called a Nix Mini Color Sensor that, when held against any surface, it will scan the surface and tell you not only what color has been scanned, but it will give you complimentary paint colors for that surface. 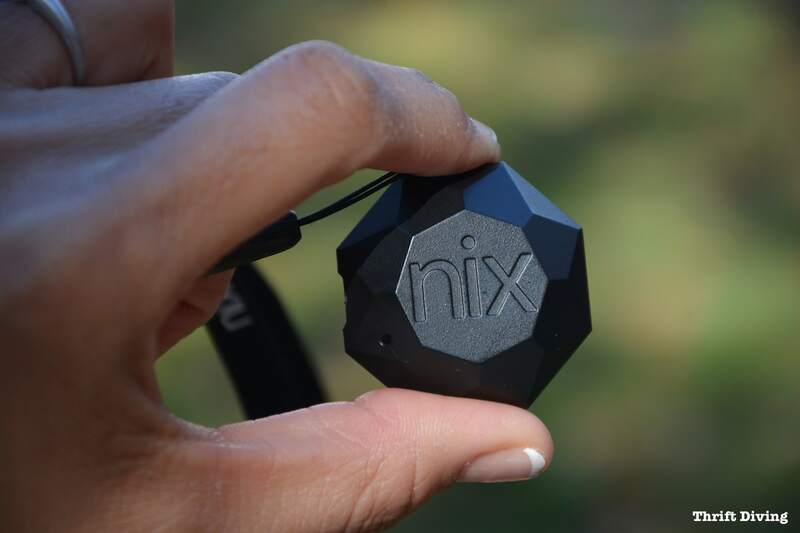 (Click here for more info about the Nix Mini Color Sensor). 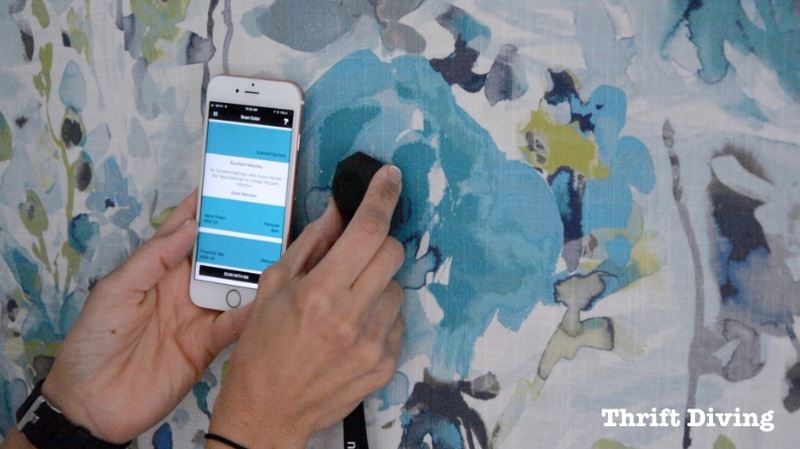 I tested out the color sensor recently by scanning some surfaces of my favorite fabric, and I loved how easy it was to get color matches and color suggestions that go well together. So you might want to consider investing in a color sensor if you’re like me and have a hard time picking out paint colors that best match your kitchen cabinets! Is the paint color I’m considering something I can live with for 2-3 years before I re-paint? 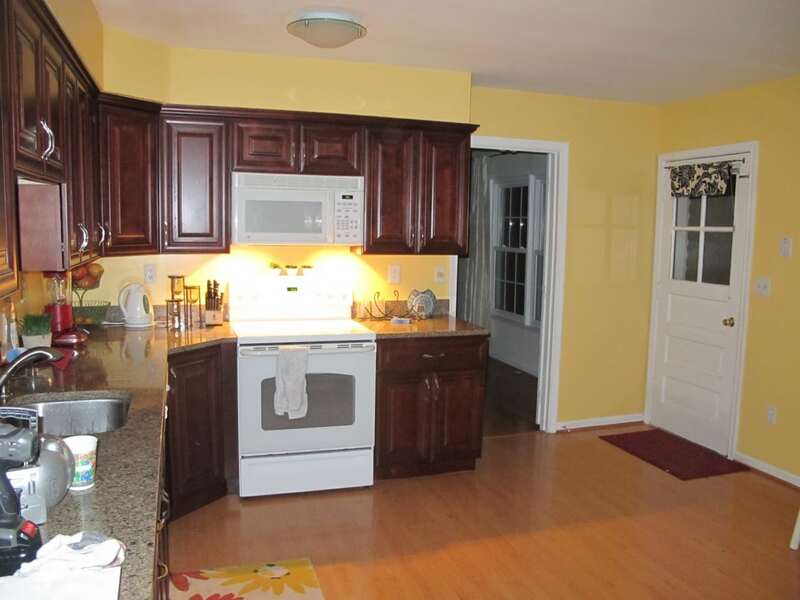 Does the kitchen get a lot of light or not very much light? (You may be able to go darker in paint color if your kitchen gets a lot of natural light). 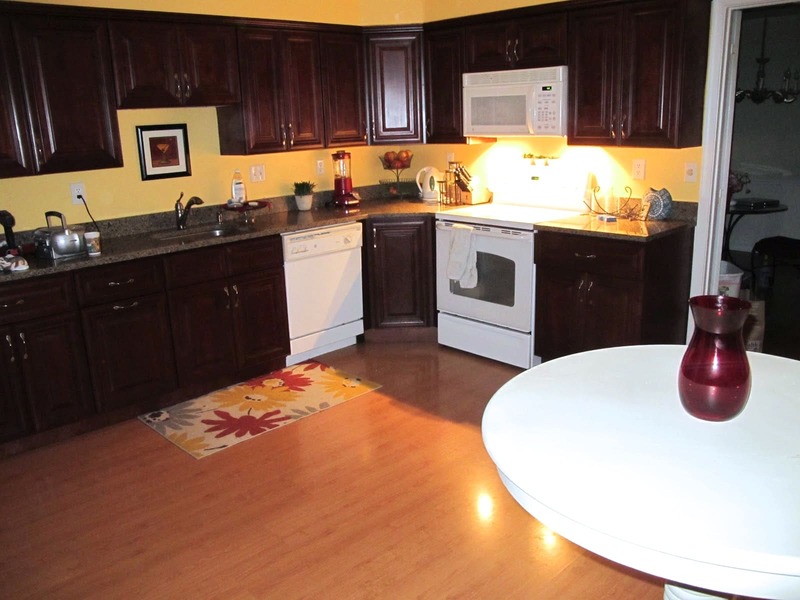 Does the paint color go well with the other furniture, fixtures in the kitchen? 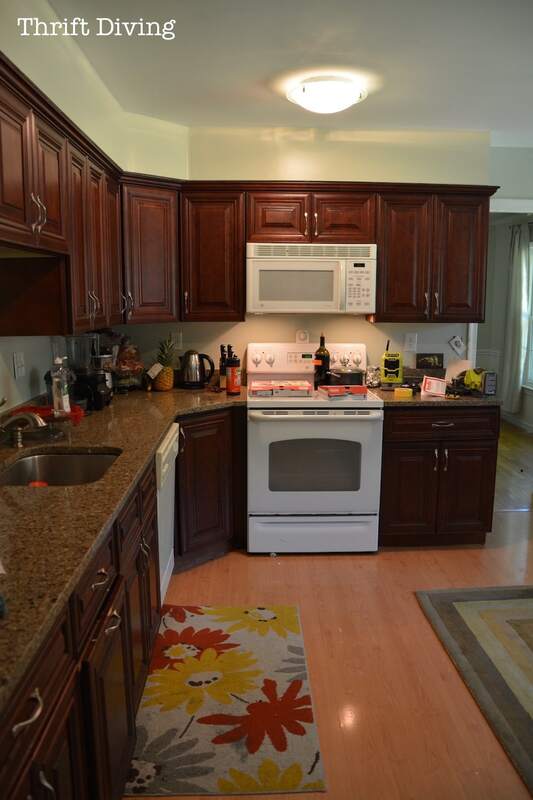 Am I planning to add a backsplash, and if so, how does it go with the paint color? QUESTION #4: Does the Floor Need to Be Replaced? Replacing floors are not cheap, either! I had my master bathroom floor replaced (layers of vinyl removed and replaced with a high-quality vinyl) and just for this small area, the cost was about $1,700. Yikes! So imagine an area the size of this kitchen being replaced! You can go ahead and just multiply that by 3 or 4 times the cost! If you don’t absolutely need your kitchen floor replaced, skip it. Get some rugs and cover it up. Maybe consider painting it, depending on the material and if it’s in good condition (I would use a high-quality paint–check your local home improvement store for that). Another option is to go right over your existing floor with ceramic tiles called SnapStone. 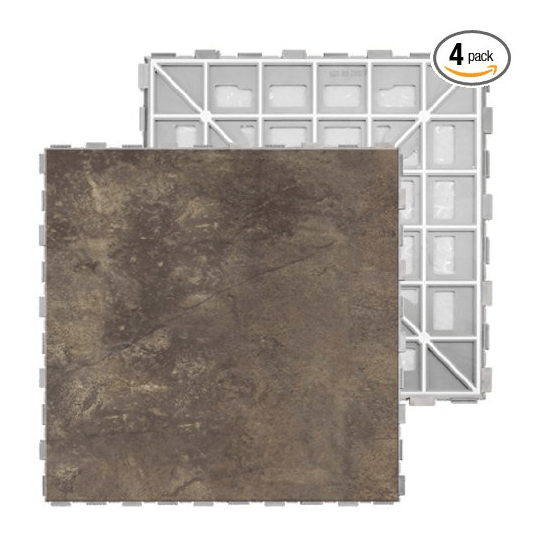 (Another brand that uses interlocking tiles that can be installed directly over existing flooring is ZipTile, although I have never used this brand). I’m embarrassed to show you, but this is what my laundry room looked like before I made it over. 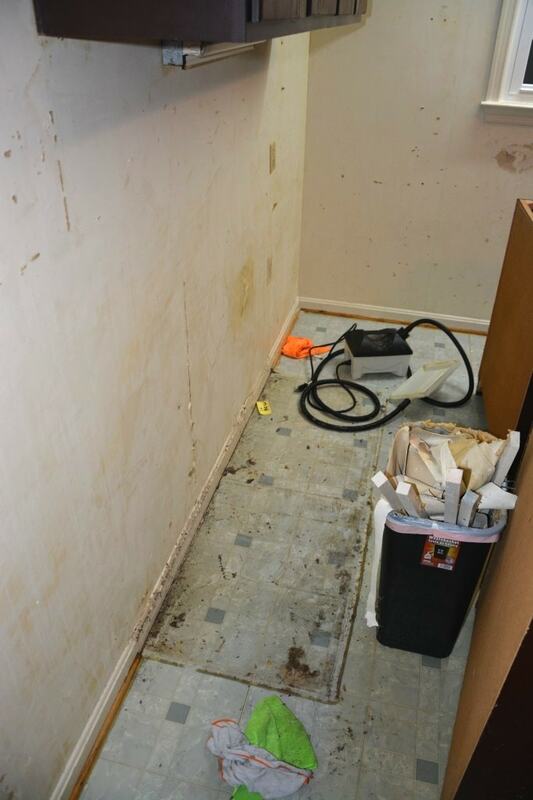 You can see not only was it dirty behind the cabinets, but the flooring was a horrible vinyl tile. The tile was in good condition, so I just went over it with the ceramic tiles called SnapStone. 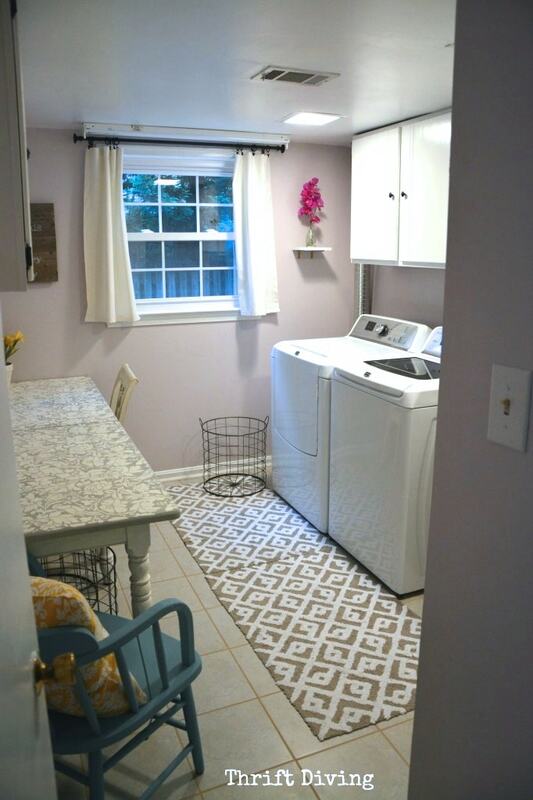 You can read all about it on the laundry room makeover post. If you have old flooring in your kitchen, yes…..you can go right over it with new tiles such as SnapStone and ZipTile. But if your floor is in decent condition, consider covering it up with rugs until you have the time or money to replace it. QUESTION #5: What Other Cheap Upgrades Can I Do? Before jumping into a kitchen makeover and spending thousands for everything “new,” think of other ways you can upgrade without the cost. Cover your refrigerator with stainless steel contact paper. Buy it on Amazon for only $12. Peel and stick tiles for the backsplash. Some options are contact paper, as well as a peel-and-stick brand called Aspect Tiles, a brand that I met at a DIY blogging conference. Stencil your backsplash with fun patterns. Build a cute eat-in kitchen table. RELATED: Click here to see my favorite wall stencil. See Your Kitchen in 3D Before Starting Your Makeover! There’s a free website I love to use to see how my room would look before starting a makeover. Using their free 3D program, you can create your room and change up the colors so you can see how it would look with various paint colors, tiles, flooring, etc., before making the change. You can also watch my tutorial on how to use Homestyler. The truth is that unless you have the skills and confidence (and the desire!! 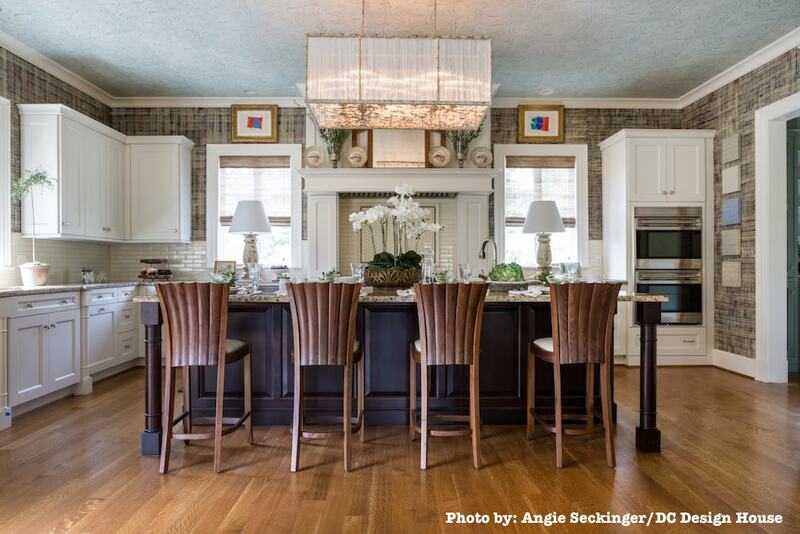 ), you may not want to touch your own house in order to do a kitchen makeover. In that case, here are some resources you can use to hire the right people. First, be sure to ask these 10 questions before hiring a contractor. Secondly, check out Angie’s List and Thumbtack.com for contractors. I am an Angie’s List member and have used the site for finding contractors for doing projects around my house. Thumbtack is fairly new, but I’ve used that site, as well, for finding professional painters for my rental property when I needed to fix it up before finding new tenants. Also, if you’re a first-time homeowner and you’ve just bought your new home, check with your real estate agent for recommendations for contractors to get some of your kitchen makeover completed. A kitchen makeover doesn’t have to cost a fortune if you’re willing and able to DIY some things, but if necessary, you can definitely hire professionals to help get it done. Are you planning a kitchen makeover? Have you looked closely at your cabinets, countertops, and floor to see if they really need to be replaced, or if you can DIY them? Drop a comment below and let’s chat about it! Like this post? 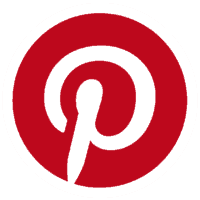 Show some love by SAVING IT on Pinterest! 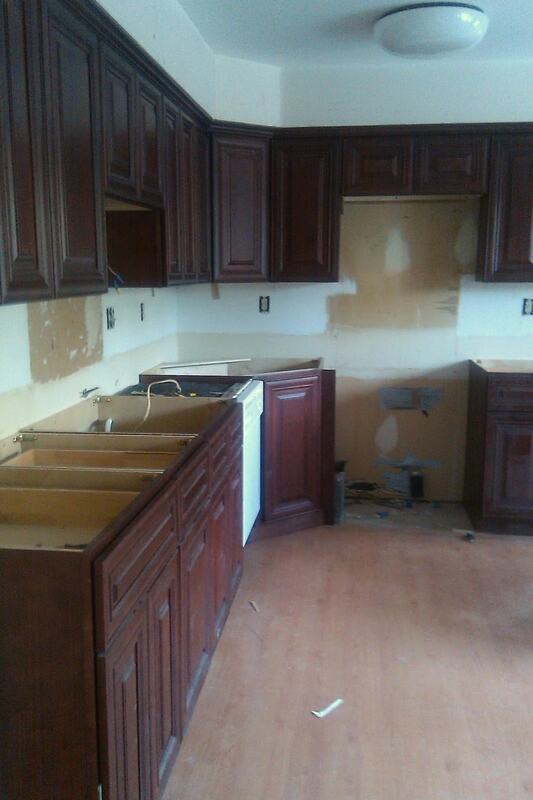 Kitchen renovation is the important part of home renovation. Before kitchen renovation you should keep some important points in your mind. You should check the condition of the flooring material. Then check the appliances of the flooring material , also select the kitchen cabinet and counter-tops of the material. In your blog one can easily get the clear idea about the kitchen renovation and that can helpful to the home owners. I have what I call restored houses. I have been my own unofficial contractor. I have a lot to share with you. And by the way I am a women and started doing this when I was fifty. And one reason being fifty was a plus because I had watched the Workman fixing houses I had lived in and made a point of talking to them and asking questions. I have a lot to tell you and there has to be a better way than this one finger way. I have a college degree but I could make more with the houses. The price of the property itself makes a big difference and how much you can sell it for in the end. The points you made about your kitchen are the same things to think about in your flip house. Reusing the good things that are already there and being clever with color does a lot. I live in the southwest and one woman took those Home Depot cabinets and painted them red. Cool! But you can’t chicken out with the walls. Down here you can do that. Anyway I will put some thoughts together if you want me to. I commend you for your practical attitude about replacing your appliances! If it ain’t broke, don’t fix it! (As “they” say!) 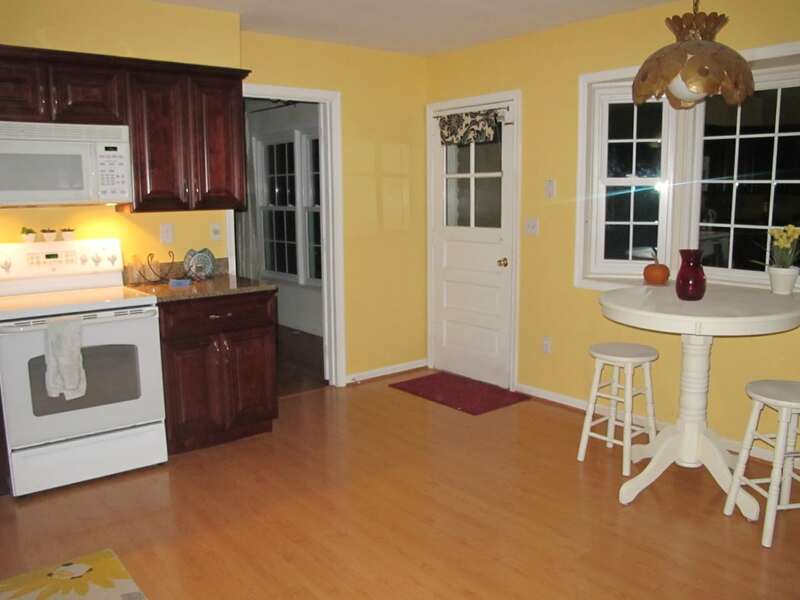 My kitchen, my family room and kitchenette are all one shade of yellow/gold or another. It matches well with my vintage stuff. So- if you like it and it’s working, that’s a very financially and ecologically responsible approach. My bathroom is an even brighter yellow- it wakes me up for work! I don’t need soothing or spa-ness at night. I just need a serious wake up call and my yellow does it for me. Your redo looks great so far- keep doing it with heart! 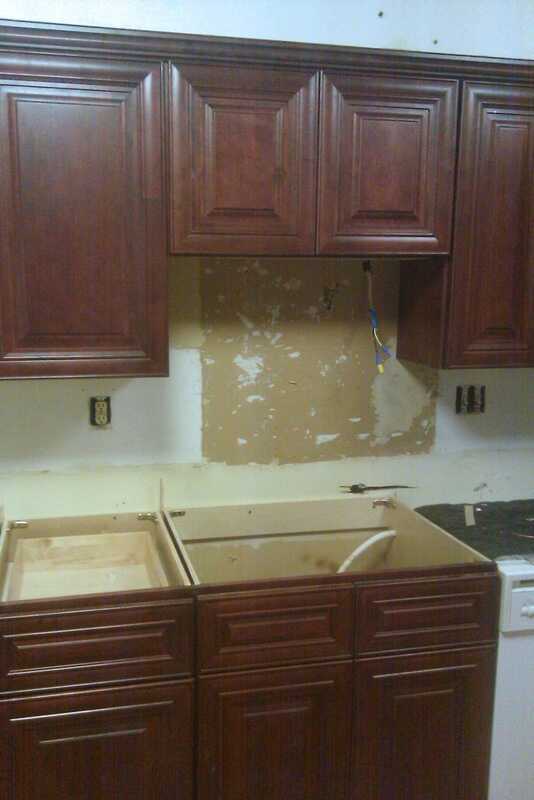 We too had to rip out cabinets. It is a chore. 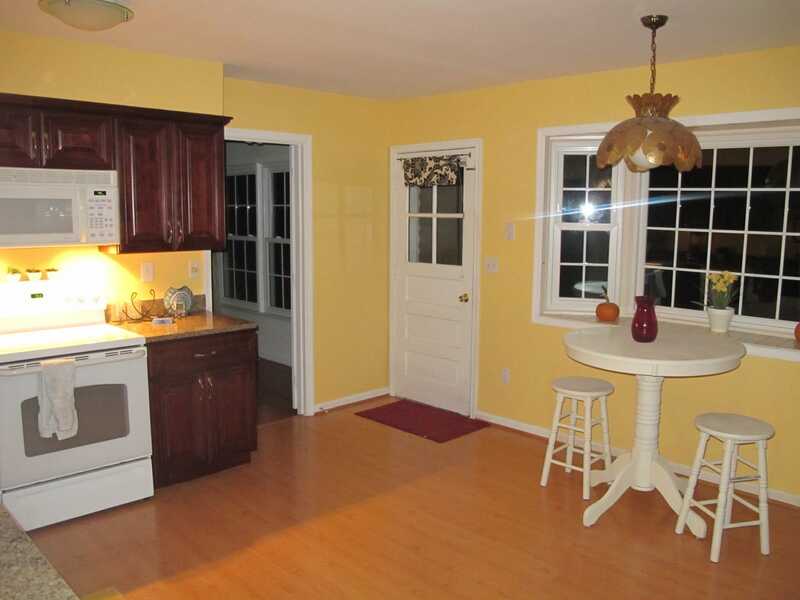 We Lso went with dark cabinets and I am going to paint the kitchen…….yellow. I love the yellow and dark cabinet combo. Our old house had all yellow toned (the color was called Dijon from Benjamin Moore) walls and ceilings too. But with the crown moulding and thick baseboards it was amazing. So I wanted that look again for my kitchen. I found a color yesterday at The Home Depot that was comparable. It is Behr and called Cellini Gold. It is a warm yellow. Not so bright. I thi it will be nice. Your kitchen looks amazing though. Great job! P.S. Ever thought of starting your own handywoman business? You’re great at remodels.